When it comes to diagnostic testing on a vehicle, there are a lot of options you could use to help you in the endeavor, but the Autel TS608 is a no brainer. This OBD2 diagnostic and tire pressure monitoring system (TPMS) tool is one of the first ones of its kind on the market today. In this detailed review, you will gain a greater understanding of how the Autel TS608 can work for you and your needs, as well as how it compares and contrasts to other choices. This diagnostic and tire pressure monitoring system (TPMS) tool is one of the first ones of its kind on the market today. 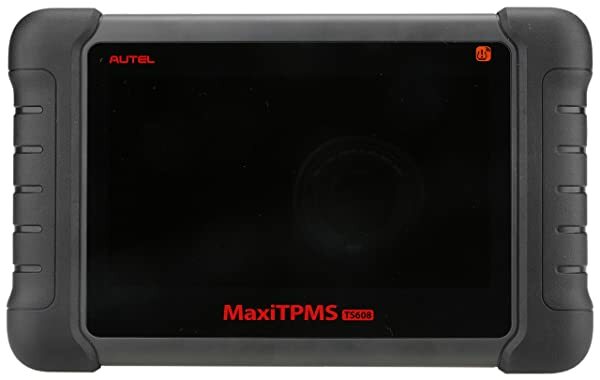 The Autel TS608, or the MaxiTPMS TS608 Service Tablet, is a wireless device that has android capabilities. It is an all-inclusive TPMS option that has a code reader for all systems, too. Some of the readings for the Autel TPMS TS608 include the anti-lock braking system (ABS), electronic parking braking (EPB), steering angle sensor (SAS), and many other reading options. Compatible with vehicles as old as 1996, you can expect this product to work for whatever car you are working on over the last two decades. Running on one lithium battery, this product works day-after-day completing important work. A one-year warranty is included with your purchase, and you can expect free updates for your software through the first year as well. 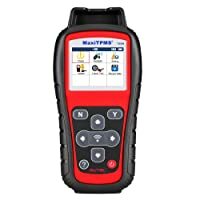 Of course, this is the most expensive option of TPMS tool that Autel has to sell, but it is well worth the money if you are using all of its features week after week. 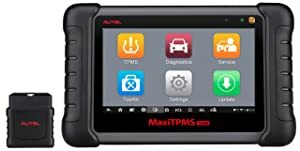 When buying the Autel MaxiTPMS TS608 TPMS Tool, it will come standard with the service tablet, a universal serial bus (USB) cable, a USB adapter, a hex key, the user manual, a carrying case, and a quick guide to help you if any questions arise. Autel TS608 is a wireless device that has android capabilities. When using the TPMS functions on the Autel TS608, all the TPMS sensors can be read easily. You can also diagnose the Engine Control Unit (ECU) issues while giving a health check of the vehicle as a whole. 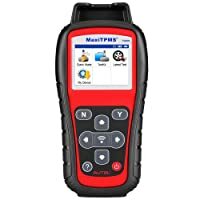 With any diagnostic trouble code that is analyzed, the MaxiTPMS TS608 can read and erase a problem when it is fixed. New identification codes can be copied or created with ease, too. If a code needs to be relearned, this device can handle this issue as well. Are you having trouble with a warning light? The light can be turned off only using the TS608. With the Autel TS608, relearning capability comes standard. The onboard diagnostics (OBD) can be relearned if any problems arise. This allows for easy fine-tuning with any vehicle, and it even has a procedure guide to walk you through issues like the parking brake. When it comes to resetting, the TS608 can reset the SAS, service mileage, service intervals, and much more. Programming and activation will run using the Autel mode, and the vehicle will be back on the road in no time at all. Presently, the MaxiTPMS TS608 covers all models up to 2018. However, the new 2019 models have not been updated on this device yet. Activate TPMS Sensors Yes, it activates known sensors. TPMS sensors can be triggered. Yes, TPMS sensors can be activated. Read TPMS Sensor Data Not only reads sensor info, but also air pressure and battery life. Data can be read. TPMS Sensor data can be read. Reprogram TPMS Reprograms up to 98% of all sensors. It is possible to reprogram. TPMS can be reprogramed with 100% efficiency. Clone TPMS Sensors This device does not have the capability. Cloning is possible with this device. Cloing can happen with the TS608. Relearn TPMS ECU This device can relearn specifics to each vehicle. TPMS ECU relearning is available. Relearning capable. Read TPMS Codes It can’t read TPMS codes. Codes can be read and processed. Sensor data can be read and erased. Read Other System Codes Other system codes can be read with the TS408. Other codes are readable using the TS508. Other codes are read using this device. Q-1: Is the Autel TPMS TS608 compatible with foreign vehicles? • This question arises because it works well with American made cars, but many are unsure if foreign vehicles work with the TS608, too. It also is a great tool when working with Ferrari, Porsche, BMW, Mercedes, and many other brands. Q-2: Does the kit come standard with sensors for the tire pressure? • Unfortunately, for the price you pay, the sensors for tire pressure are sold separately with the device you buy. However, going through the Autel site, it is quite easy to purchase any add-ons you want with your device. Q-3: What is the biggest micro SD card I can add to the TS608? 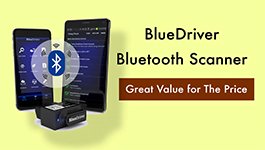 • Because of this device doubles as a tablet or laptop, you can add an SD card to save data to. The biggest card that works on this device is 16 GB. Most use anywhere from 4 to 8 GB. Q-4: Are there other language options for this device? • Autel can support other languages on the TS608, like Spanish. However, there are a few steps you have to take to make this happen. First, register the device. Next, call Autel customer service. Then, they can change the language for you. Q-5: After the warranty is up, how much does it cost to update the Autel TS608? • When the warranty is complete, it costs $350 to update the software fully through Autel. Q-6: Can diesel vehicles be scanned with the Autel TPMS TS608? • The coverage extends to trucks upwards fo 8600. This includes medium-duty trucks, but some tractor trailers, like the MS908CV or MS906CV, are compatible with this device as well. Q-7: How do I install new updates to this device? • Because this product is wirelessly capable, you can update using your wireless connection. As long as you have a hot spot or wireless Internet nearby, you should be good to go. A video of Autel TS608. Battery Light Is On: What Does It Mean? What to Do? In this review, I cover the 7 Best Audi Scan Tools in 2019 that are able to give you great compatibility and functionality at an affordable price. Want to read the honest reviews of Autel Maxi Pro MP808TS All-System OBDII Scanner with TPMS? Check things out now and find how good MP808TS is.